I took half-day off from work today to spend some quality time with Tuisku. Since Tuisku cannot work in harness due to his foot injury (involving the extensor digitorum longus muscle in his rear foot) we try to compensate for that by spending some extra time with him doing other things instead. 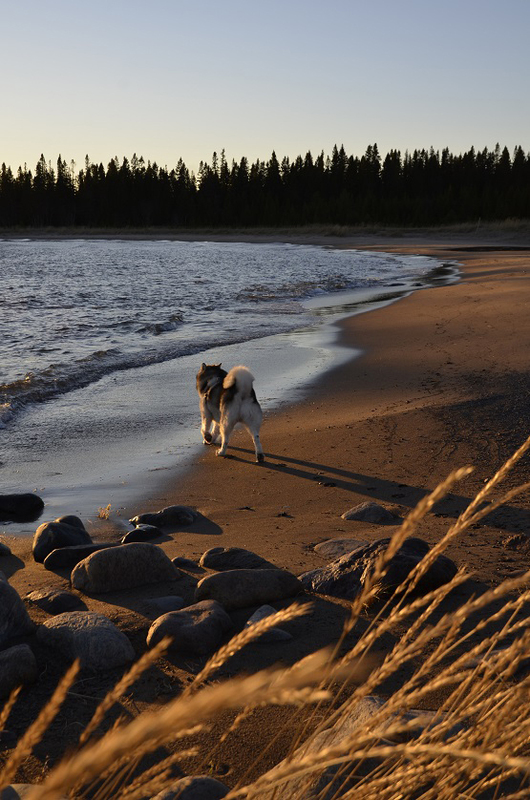 Today was a perfect day for hiking so Tuisku and I headed for the sea where we hiked along the coastal trail for a few hours between noon and dusk. 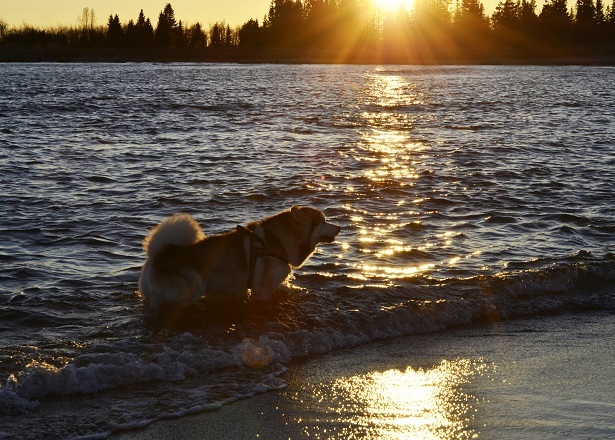 The temperature was only a few degrees above freezing but Tuisku still had to go for a swim – it doesn’t matter if the water is ice-cold, swimming is compulsory unless the sea is covered by ice! 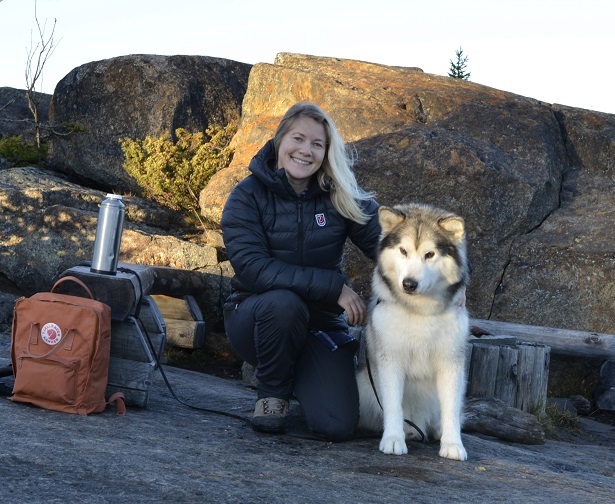 We had a nice time together, training left and right commands along the invisible trail and sit-stays in front of the camera. 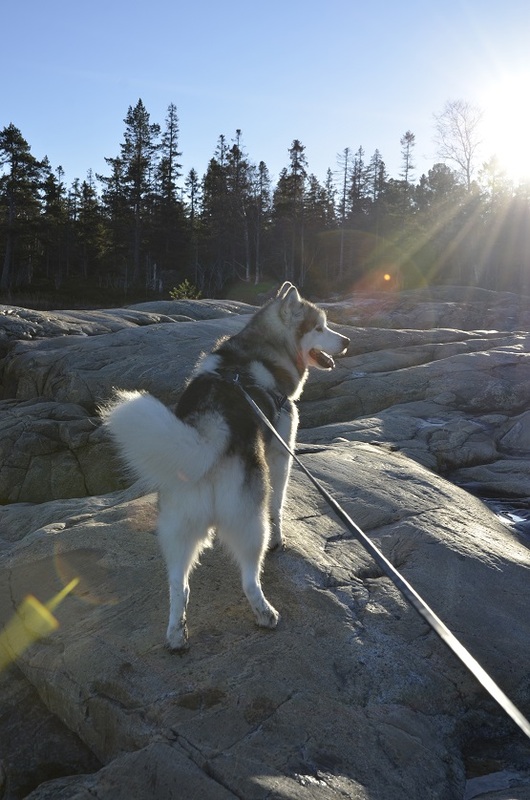 Our dog physio has recommended that we take Tuisku for walks in uneven terrain as it encourages the use of the affected muscles and also helps rebuild lost muscle mass. An untrained eye probably wouldn’t notice that Tuisku has an injury, but when you study his right rear foot more carefully, you can see that he doesn’t extend some of his toes fully. 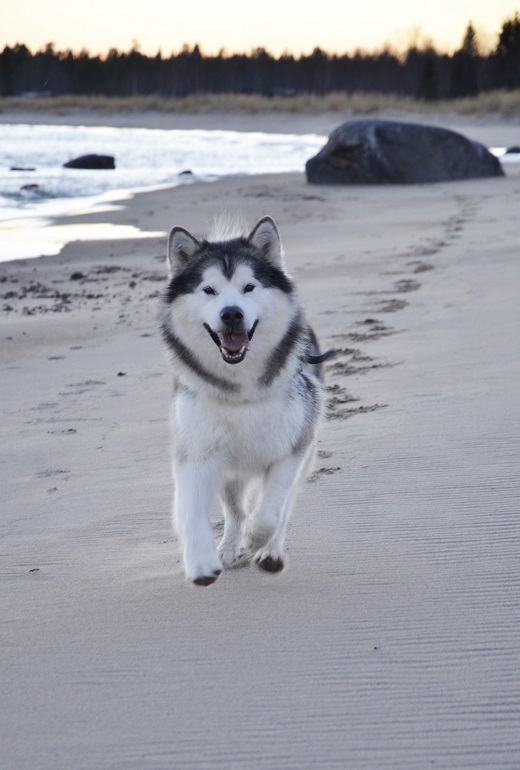 Nevertheless, Tuisku is still running around and the injury doesn’t seem to stop him from being a happy dog. And that’s the main thing. In this picture you can see that his right foot isn’t in the same position as his left foot. 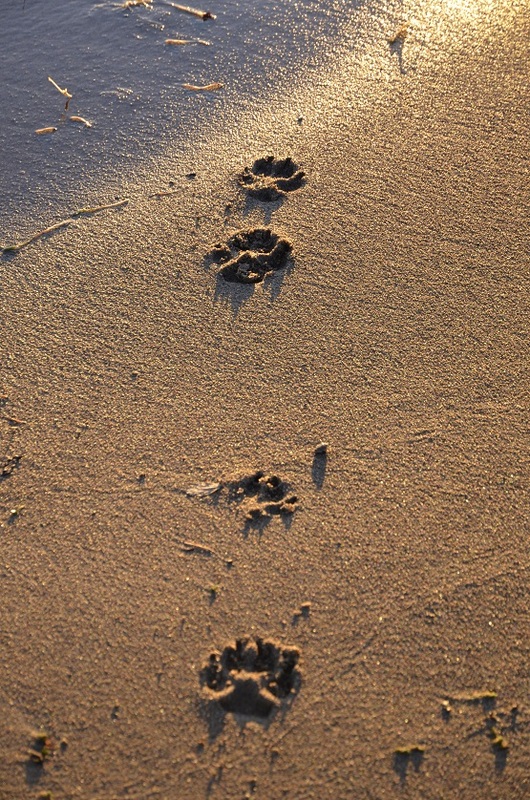 He doesn’t limp when walking or running, he just doesn’t extend his toes properly. 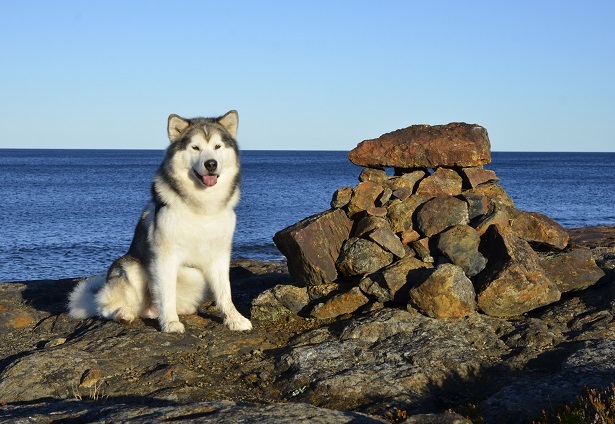 We had wonderful weather today – Tuisku enjoyed the sunshine too. I took plenty of pics as the light was so beautiful. I even managed to get a photo of us together using the self-timer. But I couldn’t convince Tuisku to look into the camera and smile – maybe next time? 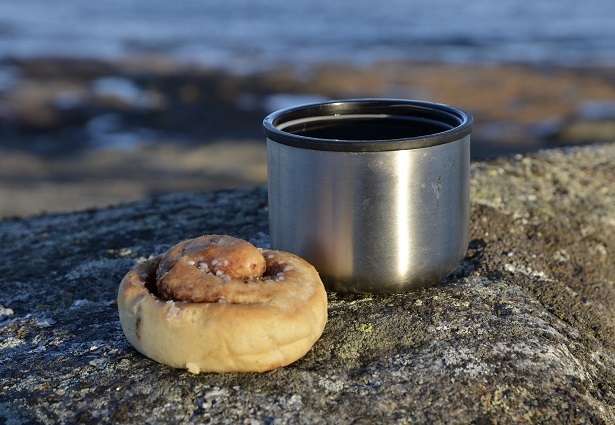 Hot chocolate and a cinnamon bun tastes good when you’re out hiking. Yay! Time for a swim! 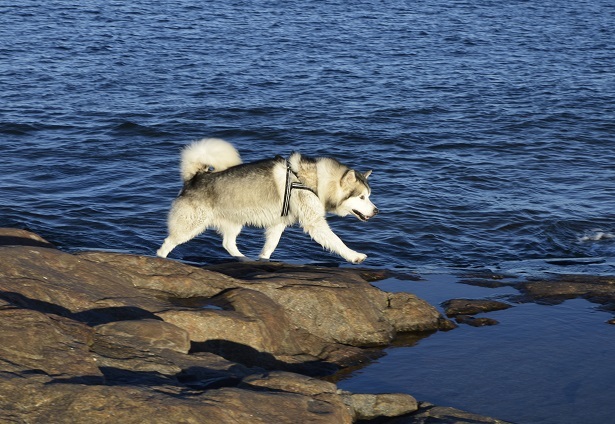 Tuisku is definitely a Dog of the North, he shakes off icy water like a polar bear. I think someone had a good time today! 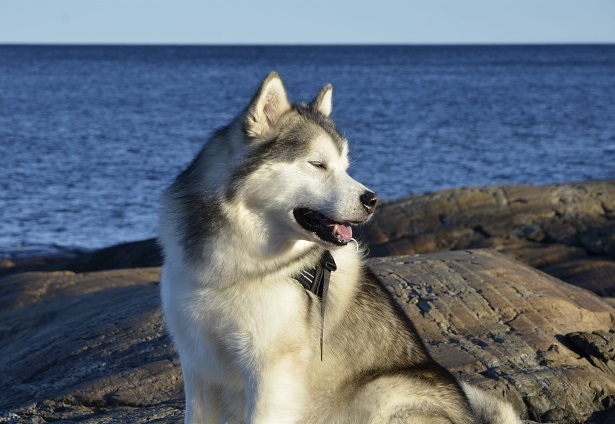 We received some more test results this week: our boys Nordiclight’s Thunder and Keikewabic’s Tundra Tuisku have both been tested for polyneuropathy with the result homozygous normal. You can learn more about this hereditary disease by reading the article Perspectives on Polyneuropathy published by the AMCA. 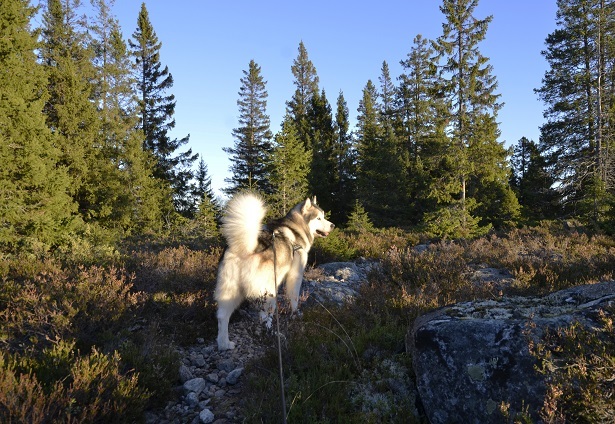 If you wish to test your Malamute we recommend that you visit the website www.ampoly.info or contact your breed club for more information. 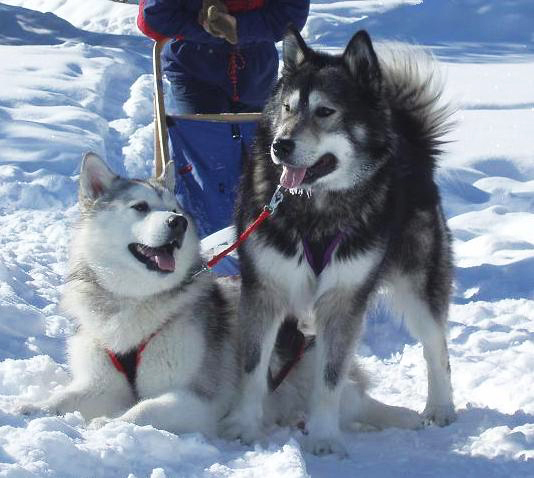 Two young Canadian boys together in front of the sled in 2006. 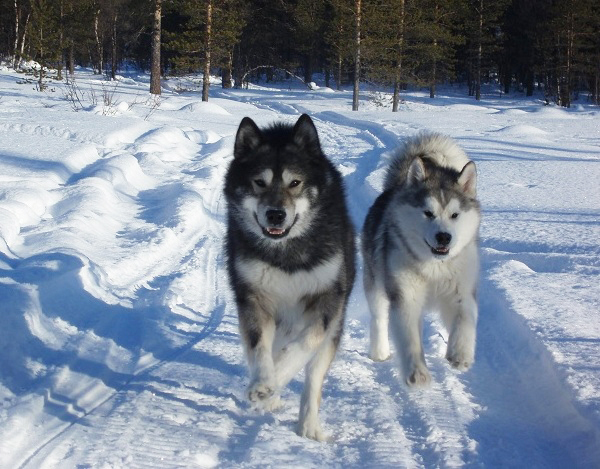 Thunder was 19 months old and Tuisku 7 months old. They both did really well during their first sledding season. 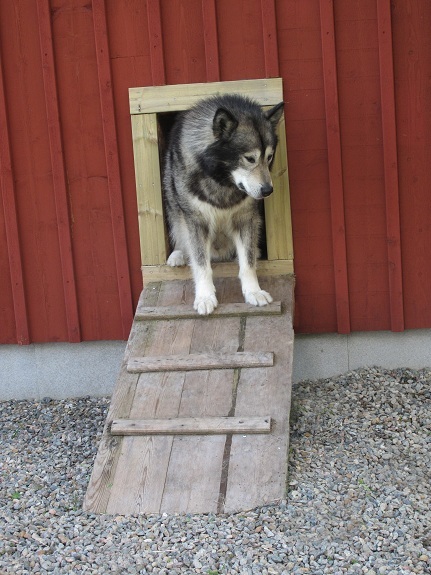 While most Malamutes prefer to live either outdoors in kennel facilities, or indoors as house pets, some dogs have individual needs that must be considered when arranging their housing. Our 7-year-old girl Leia is allergic to house dust mites which means that she can’t spend a lot of time indoors with us without developing an itch and sometimes also hot spots. However, the soft coat she developed after being spayed is not ideal for living permanently outdoors during wet weather and therefore we have come up with an alternative solution; Leia and her buddy Thunder sleep inside our barn, in a clean and dry environment that is free from the house dust mites that thrive in the indoor environment provided by homes, specifically in bedding, carpets and fabrics. Leia stepping out on a beautiful day in June. 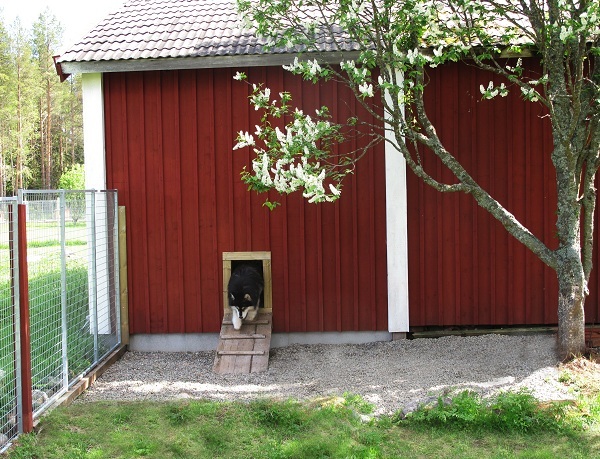 We have built dog houses in the barn to keep them warm in winter and from their indoor quarters they have a doggy door to their large outdoor enclosure and can go in and out as they please. Through this set-up we have managed to almost eliminate Leia’s skin problems. She hasn’t had a hot spot in many months and both Leia and Thunder seem to love their comfy accommodation at the “Malamute Inn”. A sleepy Thunder early in the morning.